You will earn 4,089 Reward Points. Earn 1 reward point for every 1 dollar spent. 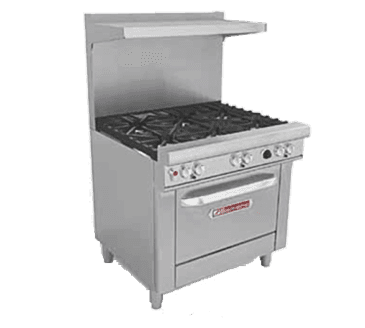 This 36" wide with a 37” high cooking top ultimate range is available in either gas or electric with 2 non-clog burners, standard grates, (1) 24" griddle left, standing pilot, 1 electric hybrid convection oven. It also includes 3 racks and 22 1/2" flue riser with shelf. This is very easy to clean with its stainless steel front, sides and shelf standard. Also comes with 6” stainless steel adjustable legs standard (casters optional). This unit also features a standing pilot for open top burners, battery spark ignition for oven bases, front located manual gas shut-off to entire range and factory installed regulator. The range top has 27” deep cooking surface. Center-to-center measurements between burners are not less than 12”, side-to-side or front-to-back. For easy cleaning, removable one piece drip tray is provided under burners to catch grease drippings. This is known to be one of the toughest commercial ranges in the industry. This ultimate range is built to last and 100% made in the USA.